WEBCommentary(tm) - Spy-Master Anna Chapman Defends Petty Woman Sandra Fluke's Demands for Free Self-Protection from Men and Ann Coulter in their War Against Womyn. Spy-Master Anna Chapman Defends Petty Woman Sandra Fluke's Demands for Free Self-Protection from Men and Ann Coulter in their War Against Womyn. If Progressive Maxim #794 is that womyn are entitled to free pills and condoms for self-protection, what are the corresponding Conservative Maxims? Doesn't Progressive Maximum #794 invoke Conservative Maxim #2 which thereby incorporates Conservative Maxims #1 and #3? Spymaster Anna Chapman rises to the defense of Sandra Fluke by revealing Ann Coulter is the Most Dangerous Woman In America as a leader of the Republican War Against Womyn. First, Anna Chapman shows us her credentials in the Progressive Cause (below-left). Next (below-right), we see Ann Coulter's battle-cry of "Conservative Maxims" in response to Sandra Fluke's humanitarian demands for free self-protection for all womyn. 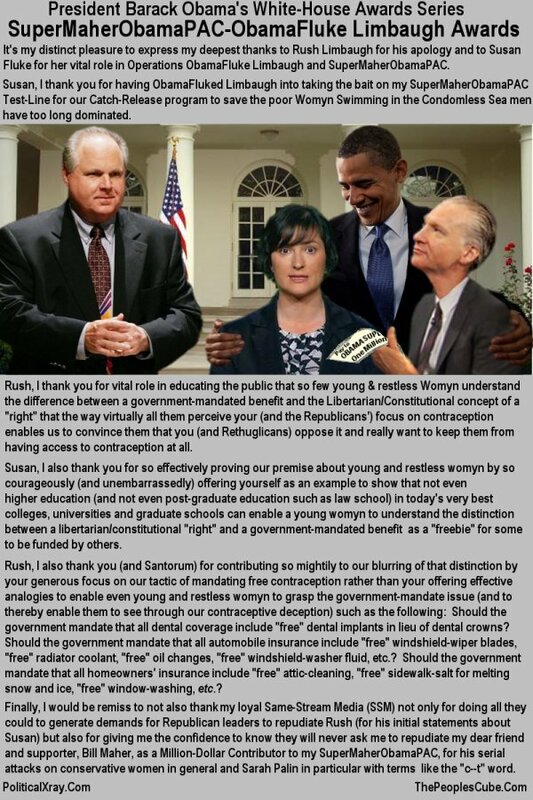 A music-video entitled "Petty Woman" (which is eeriely similar to the 1960's smash hit "Pretty Woman" by Roy Orbison) shows how Sandra Fluke learned how to get contraceptives for free without advice from Rush Limbaugh. It's really quite ingenious:. Petty Woman by PoliticalXray on Vimeo. A highly unreliable source implied that a KOOK offered such advice to Fluke. (Perhaps it's her desire to deny that a correct pronunciation of her last name rhymes with KOOK that she pronounces it to rhyme with "cluck" because she'd rather be a Fluke than a Fluke. It's also appropriate that the advice came from a venue that touts the socialistic model for free stuff for everyone in a land in which no one an fail-- i.e., ThePeoplesCube.Com. Perhaps it renders moot the ongoing controversy between Ms. Fluke and Mr.